Sir Bob Geldof has slammed the British Government as “incapable and inept” and said that Brexit will be a “disaster”. The prominent Remain campaigner also described Brexit as a “serious mistake” and said he believed Theresa May would lose Tuesday’s crucial vote in Westminster. 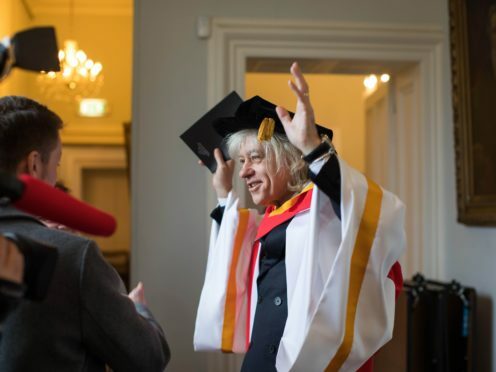 The rocker and long-standing political activist was speaking as he received an honorary doctorate at the University of Limerick on Monday. He told the media that he was “passionately against” the UK leaving the European Union but added that Europe needed to be overhauled. The humanitarian and activist said: “It’s a properly serious mistake, though having said that I do completely understand the other side of argument. “I just think it’s not wrong necessarily, it’s just that the end result of that argument is not the correct way to go. There are other ways, more positive ways. He also said that the impact on the Irish economy after Brexit will be “tough”. “It (Brexit) is an expression of English nationalism and I can’t stand nationalism. In Ireland we know where it leads to. “The English could never be English, they could never wave their flag without being called a skinhead or fascist. That’s part of this whole thing. “It (Brexit) won’t be apocalyptic but it will be a disaster. “I think that the Irish Parliament and Government have been handling this eloquently, almost in direct contrast to the chaos and nonsense of what is clearly the worst British Government in my life – incapable, inept. Meanwhile, best-selling Irish author Marian Keyes was also presented with a doctorate alongside Sir Bob at the Limerick university. Honorary degrees are conferred on people who have shown outstanding achievement in the arts, sciences, business, industry, the professions, sport, social service or public service. The writer, whose father Ted died four weeks ago, described how she has become a socialist activist over the last few years. She said: “I was always a feminist and a socialist in my principles but I was afraid to challenge the status quo. “The Ireland I was brought up in, women were supposed to keep their mouths shut and be good. I am so thrilled to be brave enough to call out what I see is injustice from time to time. University of Limerick president Dr Des Fitzgerald paid tribute to them both: “Bob has lobbied politicians and world leaders of all political hues in his herculean efforts to resolve global inequality and poverty. “In 2017, he handed over the entire archive of the Band Aid Trust to the National Library of Ireland. This will be a major resource for postgraduate students and academic researchers. “Marian has had a strong commitment to activism, particularly in the realm of gender equality.